Background: Elevated IL-10 and IL-10/IL-12 ratios and decreased IL-12 are related to poor-risk histology, poor therapy response, relapse and death from cancer. Tumor cell line shows anti-metastatic effect when they transduced with IL23. We aimed in our study to detect the pre-treatment serum level of IL10, IL12, their ratio and IL23 in paediatric haematological malignancies as well as solid tumors and compare it to their levels in healthy children to determine if they could be potential immune therapeutic targets. Materials and Methods: Pre-treatment serum levels of IL10, IL12, IL10/IL12 and IL23 were detected in sera of 27 cancer diseased children and 20 healthy control peers using ELISA technique. Results: Median IL-10, IL10/IL12 and IL-12 levels were significantly higher in cancer diseased children than in healthy controls, while median IL23 level was significantly decreased. Conclusions: Pre-treatment serum levels of IL-10, IL-12, IL-10/IL-12 ratio and IL23 in children with cancers may be of value as additional prognostic tools to predict the response to therapy. Our analysis potentiates the theory of the anti-tumor effect of IL23 and the possibilities of its use as a candidate novel drug in children malignancies. Cytokines are soluble proteins secreted by different body cells beside those immune system cells. Many cytokines are made by leukocytes (e.g., macrophages or T cells) and act on other leukocytes so they are named interleukins. Cytokines are given an interleukin number (IL1, IL2) to maintain a standard nomenclature . Interleukins are considered also as hormone like-substances that act as messengers either to regulate or stimulate the immune system . Tumor cells induce poor immune responses as they usually lack co-stimulators and do not express class I and II MHC molecules, that's why they do not activate helper T cells and Cytotoxic T Lymphocytes (CTLs). Cell mediated immunity to tumors usually enhanced through cytokines expression in tumor cells so we can treat tumor diseased individuals with cytokines that stimulate the proliferation and differentiation of T lymphocytes and NK cells. Cytokines can also augment the activation of tumor specific CD4+ T cells and CTLs to allow boosting host responses to tumors . IL12 is a promising molecule for antitumor immunotherapy. It activates T and NK cells, and induces production of IFN-γ and generation of Th1 immune responses [4,5]. The antitumor and anti-metastatic activities of IL12 have been shown in murine models including melanomas, mammary carcinomas, colon carcinoma, renal carcinoma and sarcomas . Its administration into tumor-bearing mice can retard, minimize and, sometimes, completely inhibit tumor initiation with significant therapeutic efficacy in solid as well as haematological tumors . Secretion of IL12 at tumor site by neoplastic cells engineered to release IL12 with appropriate expression vectors induces the rejection of tumor cells by CD8+ T cells and macrophage infiltration, vessel damage and necrosis . Interleukin (IL)-23 is a proinflammatory cytokine of the IL-12 superfamily . Tumor cell lines transduced with the murine IL23 gene in a retroviral vector have potent antitumor and antimetastatic effects similar to those of IL12 . Although, the antitumor responses induced by IL23 and IL12 are different, IL23 tumor suppression is evident at later time points after tumor inoculation, while IL12 tumor suppression is obvious in an earlier time point . The lack of an early antitumor response of IL23 may be due to it cannot induce higher levels of IFN-γ that is associated with IL12 secreting tumor cells or to that the preferable responsive cells to IL23 are T cells with memory phenotype . IL10 is an immune-regulatory cytokine produced by many cells. Its main biological function seems to be limitation and termination of inflammation and regulation of immune cells such as T and B cells, natural killer cells, antigen presenting cells, mast cells and granulocytes differentiation and proliferation of several . Recently, IL10 is suggested to have a role in infectious and non-infectious particles elimination. Some animals and human investigations suggested a major role of IL10 in malignancy and autoimmune disorders [14,15]. IL10 overexpression is found in some tumors as melanoma and several lymphomas and is considered to enhance tumor development [16-18]. It is also suggested that IL10 and its receptor system may become a new therapeutic target . Human cancer studies suggest that elevated IL-10, IL-10/IL-12 ratio and decreased IL-12 correlated with poor-risk histology, poor response to therapy, relapse and death from cancer . Our current study aimed to detect the pre-treatment serum level of IL10, IL12, IL10/IL12 ratio and IL23 in paediatric haematological malignancies as well as solid tumors, and correlate them with those levels in healthy individuals to determine if they could be potential immune therapeutic targets. Twenty-seven cancer diseased children and 20 healthy control peers were included in our study. The cases are cancer diseased children presented to Haematology/ Oncology center at Maternity and Children hospital (MCH) at Almadinah Almounourah, Saudi Arabia and Paediatric Department at Sohag University hospital, Sohag, Egypt over a period of one year. Exclusion criteria are those who started chemotherapy. The controls were healthy peers and we excluded those suffering of any immunological, inflammatory or infectious diseases. A written informed consent was taken from patient’s legal guardians. A prospective case control study was conducted on our subjects. Hospital ethics and review board’s approval was taken before starting the study. Blood samples were collected from cases immediately after diagnosis, before starting chemotherapy, and also from healthy controls. 5 ml of whole blood were collected under complete aseptic conditions from each patient or control. Blood samples were left for 30 to 60 minutes for spontaneous clotting at room temperature and then centrifuged at 3000 rpm for 10 minutes. Serum samples were separated into another set of tubes and were kept frozen at-20°C for detection of serum cytokines. Pre-treatment serum levels of IL10, IL12, IL10/IL12 and IL23 were measured in serum of patients and controls using quantitative sandwich Enzyme-Linked Immunosorbent Assay (ELISA) technique. We measure each sample in triplets and the median of the three measures was taken. For IL10 we used RayBio Human IL10 kit (Norcross, Georgia, USA), for IL12 and we used Quantikine Human IL12 and IL23 immunoassay kit (R&D system, Minneapolis, USA) and used for IL10/IL12 ratio with the minimum detectable dose established as 1 pcg/ml. All data are expressed as median and range. Statistical analysis of all variables was performed with ANOVA test for inter-group comparisons and two-tailed t-test for intra group comparison. P<0.05 was considered statistically significant. Data were analysed by SPSS (version 10). Study population consisted of 27 cancer diseased children and 20 healthy controls. Acute Lymphoblastic Leukaemia (ALL) diseased children represented 70.4% (19/27) of cases while Acute Myeloid Leukaemia (AML) diseased children were 18.5% (5/27). Solid tumor diseased children in our study population were consists of; Non-Hodgkin Lymphoma (NHL) one patient, hepatoblastoma one patient and Wilms tumor one patients. Patients and controls characteristics are shown in (Table 1). Table 1: Patients and controls characteristics. IL10, IL12, and IL10/IL12 ratio serum levels were increased significantly (p value<0.05) in cancer diseased children at time of diagnosis, while serum IL23 level was significantly increased in healthy population (Figure 1). 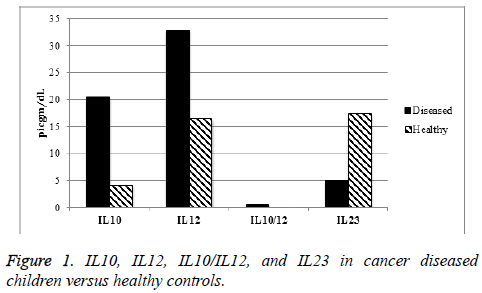 Figure 1: IL10, IL12, IL10/IL12, and IL23 in cancer diseased children versus healthy controls. Comparing ALL diseased children to those with AML, median serum level of IL10 was significantly increased (P<0.05) in AML patients. Although median serum level of IL12 and IL0/ IL12 ratio were also increased in AML, this increase was not statistically significant. On the other hand, median serum level of IL23 increased significantly in ALL patients (Table 2). Table 2: IL10, IL12, IL10/IL12 and IL23 in ALL and AML diseased children. Comparing solid tumors patients to leukaemia (ALL and AML) patients, IL10 was significantly increased in solid tumor patients while IL23 was significantly decreased (Table 3). Table 3: IL10, IL12, IL10/IL12 and IL23 in leukaemia versus solid tumor diseased children. Cancer is a complex disorder where it has interactions between normal and neoplastic cells. Most of current cancer therapies rely on drugs or radiation that kill dividing cells or block cell division. These ways of therapy have severe side effects on normal proliferating cells. Therefore, a great hope in cancer therapy is on immunologic approaches, which may be specific for tumors and will not cause harm for normal body cells. Cancer immunotherapy works through augmenting the weak host immune response to developing tumors . Recently, several interleukins have been found to have promise for tumor immunotherapy. One strategy is to use interleukins such as IL-12. IL12 is acting as a key regulator of cellmediated immune responses through the differentiation of CD4+ T cells into type 1 helper T cells (Th1) producing interferon-γ. IL-12 has suppressed tumor growth in all murine models examined [21,22]. In our study IL12 level showed significant increase in cancer diseased children more than healthy children but there is no significant difference in its level between leukaemia and solid tumor diseased children or even between myeloid or lympoblastic leukaemia. This significant elevation of IL12 level in cancer diseased children may indicate that these tumors may have a good response to tumor therapy and following these children up during their cancer therapy is essential as they may have a better prognosis than cancer diseased children with lower IL12 levels. Besides, Immune therapy directed to augment the immunological effect of IL12 in these tumors may help in elimination of tumor cells and cure of these children. On the other hand, it is shown previously that IL23 expression in tumor cells induces tumor suppression [11,12]. In our study, there was decreased serum level of IL23 in cancer diseased children, which makes it a potential good therapeutic target where induction of more IL23 serum level in cancer diseased children may help in suppression of their cancer progression. Our results showed also that IL23 level is significantly lower in solid tumors than in leukaemia patients, which makes IL23 is a potential therapeutic target in solid tumors. Similarly, it is known that IL10 have high levels in some malignancies e.g. melanoma, and its presence promote tumor growth and proliferation [23-26]. Our results showed that IL10 level is markedly increased in cancer diseased children with significant increase in its serum level in myeloid leukaemia than lymphoblastic leukaemia. Also its level is significantly increased in solid tumors than in leukaemia. These findings may suggest that IL10 could be a significant immunotherapeutic target mainly in solid tumors or myeloid leukaemia through decreasing its expression by down regulation of its gene or block of its action on receptor level. Besides, our results showed also increase IL10/IL12 ratio in cancer diseased children that indicates lowering of this ratio may improve prognosis and subsequently the survival of cancer diseased children. Overall, our results indicate that serum level of IL10, IL12, IL23 in cancer diseased children may allow them to be immune-therapeutic targets for cancer therapy. These findings give future hope for specific immunotherapy in treating cancer diseased children and overcome the severe side effects of chemotherapy or radiotherapy. Pre-treatment serum levels of IL-10, IL-12, IL-10/IL-12 ratio and IL23 in children with cancers may be of value as additional prognostic tools to predict the response to therapy. Our analysis also potentiates the theory of the anti-tumor effect of IL23 and the possibilities of its use as a candidate novel drug in resistant malignancies. The authors appreciate the great help of doctors and staff nursing at MCH hospital in Almadinah Almounrah, Saudi Arabia and in haematology/oncology unite at Sohag university hospital in Egypt for that facilitate this study. This research work was not funded by any grants. The authors declare they have no conflicts of interest in regards this work. Yoshimoto T, Morishima N, Okumura M, Chiba Y, Xu M. Interleukins and cancer immunotherapy. Immunotherapy 2009; 1: 825-844. Leonard WJ. Cytokines and immunodeficiency diseases. Nat Rev Immunol 2001; 1: 200-208. Lin CL, Hsiao G, Wang CC, Lee YL. Imperatorin exerts antiallergic effects in Th2-mediated allergic asthma via induction of IL-10-producing regulatory T cells by modulating the function of dendritic cells. Pharmacol Res 2016; 110: 111-121. Thomas ED, Meza-Perez S, Bevis KS, Randall TD, Gillespie GY. IL-12 expressing oncolytic herpes simplex virus promotes anti-tumor activity and immunologic control of metastatic ovarian cancer in mice. J Ovarian Res 2016; 9: 70. Poudel B, Ki HH, Lee YM, Kim DK. Induction of IL-12 production by the activation of discoidin domain receptor 2 via NF- κB and JNK pathway. Biochem Biophys Res Commun 2013; 434: 584-588. Yuzhalin AE, Kutikhin AG. Interleukin-12: clinical usage and molecular markers of cancer susceptibility. Growth Factors 2012; 30: 176-191. Huang Z, Yang Y, Jiang Y, Shao J, Sun X, Chen J. Anti-tumor immune responses of tumor-associated macrophages via toll-like receptor 4 triggered by cationic polymers. Biomaterials 2013; 34: 746-755. Michelin MA, Abdalla DR, Aleixo AA, Murta EF. Peripheral helper lymphocytes produce interleukin 12 in cancer patients. Clin Med Insights Oncol 2013; 7: 75-81. Ersvær E, Melve GK, Bruserud O. Future perspectives: should Th17 cells be considered as a possible therapeutic target in acute myeloid leukaemia patients receiving allogeneic stem cell transplantation? Cancer Immunol Immunother 2011; 60: 1669-1081. Sarin R, Wu X, Abraham C. Inflammatory disease protective R381Q IL23 receptor polymorphism results in decreased primary CD4+ and CD8+ human T-cell functional responses. Proc Natl Acad Sci USA 2011; 108: 9560-9565. Jacobo P, Perez CV, Theas MS, Guazzone VA, Lustig L. CD4+ and CD8+ T cells producing Th1 and Th17 cytokines are involved in the pathogenesis of autoimmune orchitis. Reproduction 2011; 141: 249-258. Ionescu MA, Lipozencia J. Could anti IL12/23 therapy replaces anti-TNF biologics? Acta Dermatovenerol Croat 2009; 17: 166-169. Chiricozzi A, Zhang S, Dattola A, Cannizzaro MV, Gabellini M. New insights into the pathogenesis of cutaneous autoimmune disorders. J Biol Regul Homeost Agents 2012; 26: 165-170. Liu L, Zheng F. IL-10 -1082A/G, -592C/A and -819T/C polymorphisms in association with lung cancer susceptibility: a meta-analysis. Onco Targets Ther 2016; 9: 6083-6091. Liu D, Zhang N, Zhang X, Qin M, Dong Y. MiR-410 down-regulates the expression of interleukin-10 by targeting STAT3 in the pathogenesis of systemic lupus erythematosus. Cell Physiol Biochem 2016; 39: 303-315. Korobeinikova E, Myrzaliyeva D, Ugenskiene R, Raulinaityte D, Gedminaite J, Smigelskas K. The prognostic value of IL10 and TNF alpha functional polymorphisms in premenopausal early-stage breast cancer patients. BMC Genet 2015; 16: 70. Kucera R, Topolcan O, Treskova I, Kinkorova J, Windrichova J. Evaluation of IL-2, IL-6, IL-8 and IL-10 in malignant melanoma diagnostics. Anticancer Res 2015; 35: 3537-3541. Morandi F, Croce M, Cangemi G, Barco S, Rigo V, Carlini B. IL-10 and ARG-1 concentrations in bone marrow and peripheral blood of metastatic neuroblastoma patients do not associate with clinical outcome. J Immunol Res 2015; 2015: 718-975. Miteva LD, Stanilov NS, Deliysky TS, Stanilova SA. Significance of -1082A/G polymorphism of IL10 gene for progression of colorectal cancer and IL-10 expression. Tumour Biol 2014; 35: 12655-12664. Bien E, Balcerska A, Adamkiewicz-Drozynska E, Rapala M, Krawczyk M, Stepinski J. Pre-treatment serum levels of interleukin-10, interleukin-12 and their ratio predict response to therapy and probability of event-free and overall survival in childhood soft tissue sarcomas, Hodgkins lymphomas and acute lymphoblastic leukaemias. Clin Biochem 2009; 42: 1144-1157. Yue T, Zheng X, Dou Y, Zheng X, Sun R, Tian Z. Interleukin 12 shows a better curative effect on lung cancer than paclitaxel and cisplatin doublet chemotherapy. BMC Cancer 2016; 16: 665. Chang MC, Chen YL, Chiang YC, Chen TC, Tang YC, Chen CA. Mesothelin-specific cell-based vaccine generates antigen-specific immunity and potent antitumor effects by combining with IL-12 immunomodulator. Gene Ther 2016; 23: 38-49. Sabat R, Asadullah K. Interleukin-10 in cancer immunity, in cancer immune therapy: experiences and future strategies. Wiley-VCH Verlag GmbH Weinheim Germany 2002. Chan IH, Wu V, McCauley S, Grimm EA, Mumm JB. IL-10: Expanding the Immune Oncology Horizon. Receptors Clin Investig 2015; 2.